The next generation of Crye Precision Combat Apparel features innovative, custom stretch VTX RIPSTOP™ fabric. Torso constructed with lightweight, high performance, flame-resistant jersey fabric. 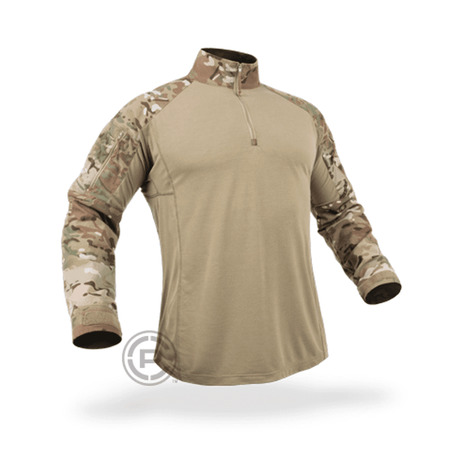 Invista’s T420 high tenacity nylon fiber makes it lighter and stronger in the sleeves. 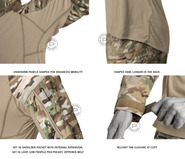 Designed to be worn under body armor, the integrated stretch allows for a slimmer cut with maximum mobility. Zippered shoulder pockets are low profile and engineered to reduce bulk while still allowing room for all essential gear. Zip collar for easy donning/doffing. Designed for use with all removable AIRFLEX™ ELBOW PADS (sold separately).